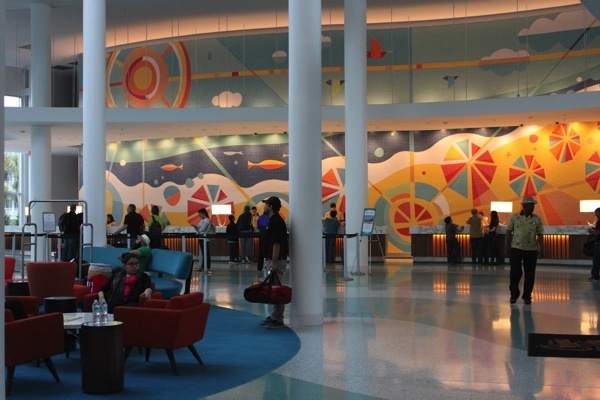 Cabana Bay Beach Resort is Universal’s first on-site value resort. 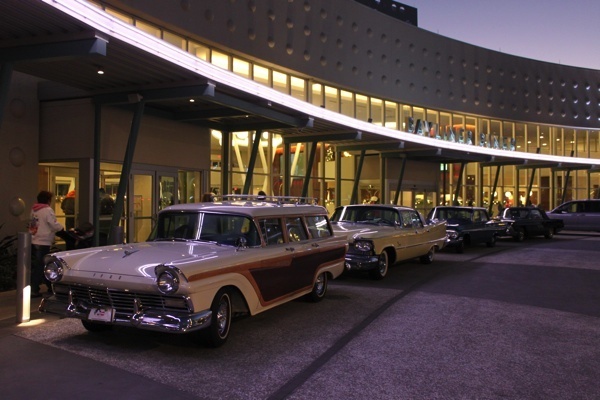 The theme is mid-century modern, with lots of windows, bright colors, and period-appropriate lighting and furniture; and vintage cars parked in front of the hotel. The lobby is huge offering multiple lounges, a business center and an on-site Starbucks. I liked the Swizzle Lounge; it offers a good variety of cocktails in a nice setting, –at reasonable prices. The Bayliner Diner food court, with a seating area showing 1950s TV clips, is better than the food courts at any of the Disney value resorts. A nice selection of sandwiches, a salad bar and a carving station with daily changing roast caught my eye. There is of course the traditional fare such as burgers, pasta dishes and pizza but I loved the Brazilian Beef Churrasco, (marinated and grilled flat iron steak with chimichurri sauce) which came with a choice of two sides. At $13.65 it was a very satisfying, reasonably priced dinner. The best part however, being Belgian and in love with my fries, is that the French Fries at Bayliner are served with truffle salt and fresh rosemary. Cabana Bay Beach Resort has an on-site 10-lane bowling alley called Galaxy Bowl where you can enjoy a game and a meal, table service. 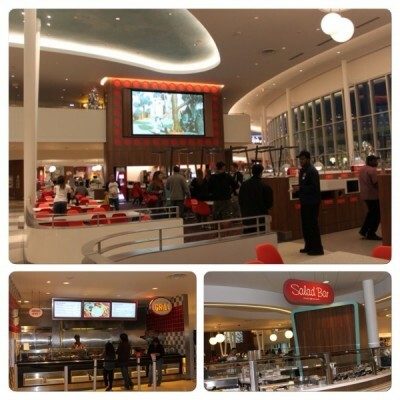 The menu includes burgers, pizza, chicken wings, nachos, sandwiches and salads. OK, nothing to write home about but the bar offers wine and beers and completely different cocktails than those available at the Swizzle Lounge. Bowling costs $15 ($9 for children) and includes shoe rental. The hotel has two pools, my favorite being Lazy River Courtyard – featuring a zero-entry pool with sand beach, and of course a lazy river, complete with waterfalls. 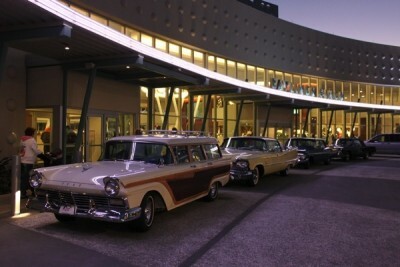 Outdoor movies are shown nightly near the pool. I was amazed to learn that Cabana Bay Beach Resort guests are also welcome at the pools of the three other Universal properties. There are also two pool bars. Atomic Tonic is for drinks only and located at the Cabana Courtyard pool, while The Hideaway Bar and Grill, located near the lazy river offers drinks and a classic poolside menu. During my stay I booked a standard room. Standard rooms are equipped with two queen beds, a table with two chairs, one 40″ flat panel television with HD channels, a Cuisinart single coffee pod brewer, iron, ironing board, hair dryer and in-room safe. The room was nicely decorated and tip top clean. I also loved having charging outlets everywhere I looked. There is complimentary wireless Internet access for up to four devices per room and in most common areas of the hotel. And there was light! I am no fan of rustic furniture and small coffee table lamps, so I was in heaven the moment I entered my room. 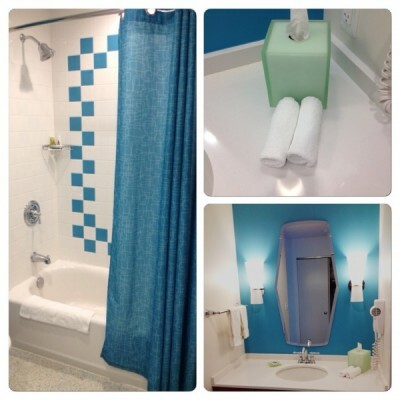 I absolutely liked the light fixtures and the fact that the room was decorated in light, bright colors and well lit. 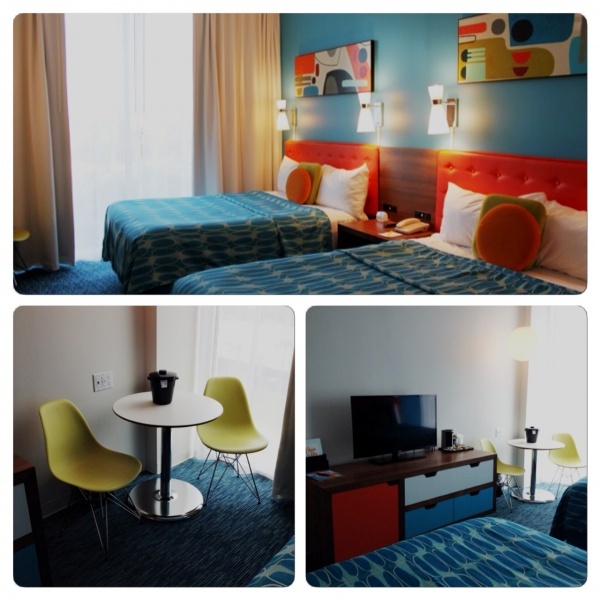 Cabana Bay Beach Resort also offers family suites, which have a small bedroom with two queen beds, divided from the living area and kitchenette by a sliding screen. The living room has a pullout sofa and the bath is divided into three convenient sections: toilets, sink area, and shower room with an additional sink. The kitchenette has a microwave, coffeemaker and a small fridge. 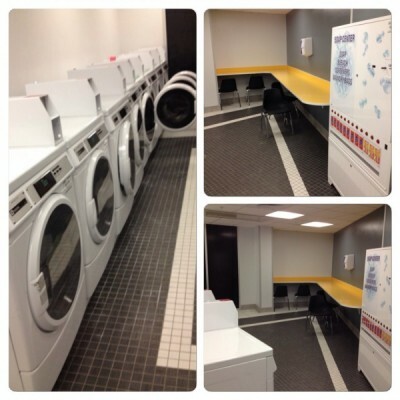 Last but not least each floor has a state of the art laundry room. While there is no boat service to the parks, there is excellent bus service. If you are not too tired you can also walk as there is a bridge connecting Cabana Bay Beach Resort to CityWalk and the parks. I used the bus every day and loved it. The bus transportation is far superior to any bus transportation offered by Disney. I never waited more than 10 minutes. Staying at Cabana Bay Beach Resort I did not qualify for complimentary Universal express pass but for early entry, which is a big bonus especially when visiting The Wizarding World of Harry Potter. The Cabana Bay Beach Resort bus in the morning would leave as soon as it was full and was immediately replaced with another bus waiting to shuttle guests to the parks. 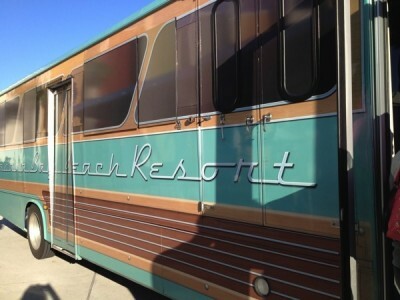 Cabana Bay Beach Resort also has shuttles to SeaWorld, Discovery Cove, Aquatica, and Wet ’n Wild. I now have stayed twice at Cabana Bay Beach Resort and I will certainly return. I have no hesitation recommending the hotel. I can’t wait to see what the expansion which will add two more towers to the resort. 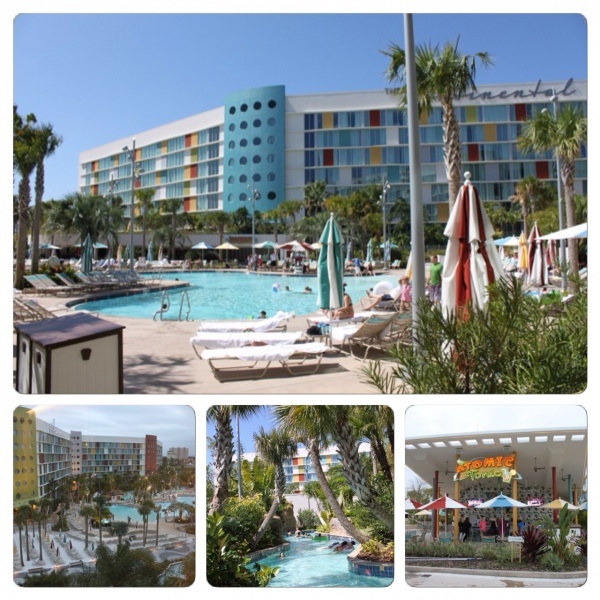 Cabana Bay Beach Resort offers excellent value for your money. And did I mention that I shamelessly took advantage of ordering free special wake up calls by Betty Boop and the next day by the Blue Man Group? Other options were Transformers, Spiderman, The Cat in The Hat, and Olive Oyl. On Friday nights select Universal characters make their appearances in the lobby of the hotel. Check upon arrival for schedule as characters and times do change. The rates for a standard room, sleeping four is $119 – $210. Family suites, sleeping six, go for $174-$294. If Universal would consider adding their very own Magical Express transportation from the Orlando airport my world would be perfect. I know there is something similar but not yet equal to the Magical Express. Better yet, how about a monorail that would connect the hotels, the different parks, make a stop at Disney’s TTC and have MCO at the end of the line. Who is with me? 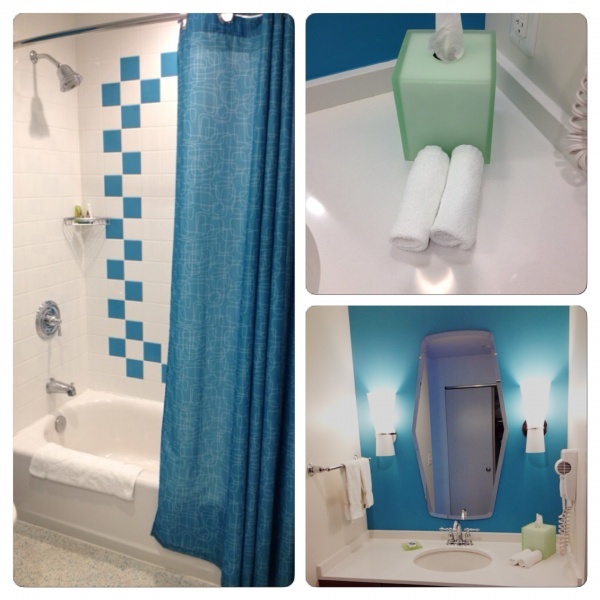 Have you stayed at Cabana Bay Beach Resort? What were your thoughts? Beside the microwave, is there another way to cook in the family suite? We are a group of 6 (4 adults, 2 kids) and think it might be better to have our own rooms now versus the family suite if there really is no way to cook. We will be doing laundry half way thru the trip. Do you know where the laundry rooms are located? Do they tend to get busy? 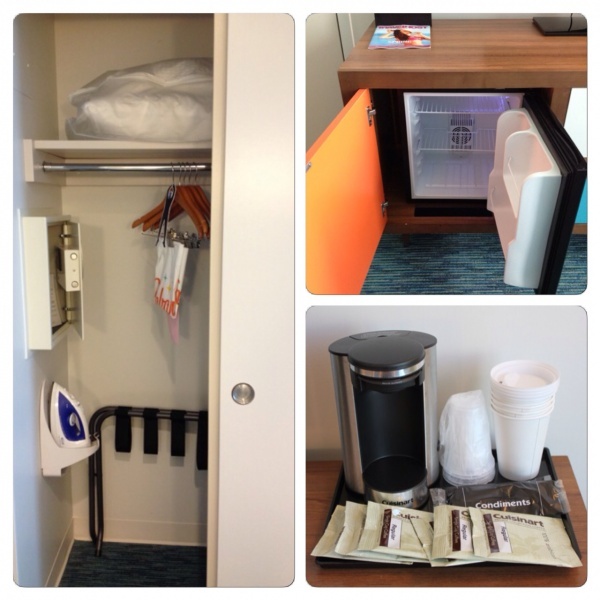 Hi Becky: Each section has laundry facilities. They are very nice and I have never seen them busy. $3 wash, $3 dry, $1 soap.